Definitely a cuke overload. Only one thing for it, make pickles! 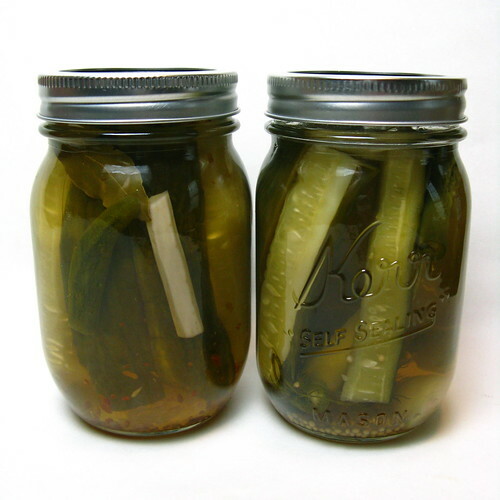 We made three different flavors of pickles by using the same brine but adding different seasonings to each jar. 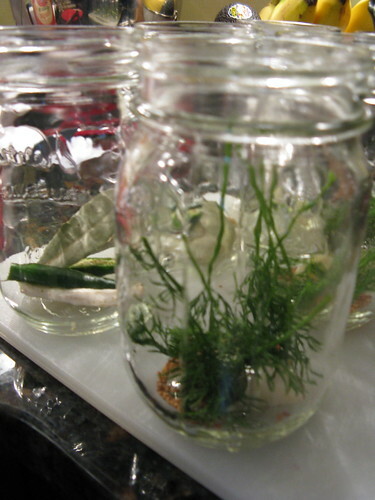 One type was a traditional dill with a garlic clove, fresh dill, a bay leaf & 1/2 t mustard seeds. The next was spicy with a halved jalapeno (seeds & all), a piece of fresh peeled horseradish root, a bay leaf & 1/4 t crushed red pepper flakes. The last one was sort of a mix of the two with all the items in a traditional dill plus a jalapeno. Tie the pickling spice into a little bundle using cheesecloth. Add everything to a stainless steel or enamel pot. Bring to a boil stirring to dissolve sugar & salt. Let boil gently for 15 minutes. Allow to sit in a cool dark place for a few weeks before eating. 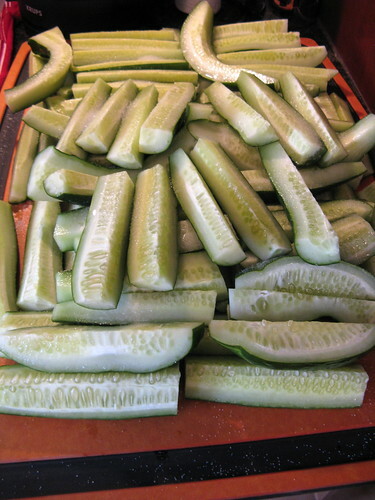 For a crispier pickle, we salted our sliced cukes & let them sit for two hours to remove some of the water. We rinsed them in could water before packing them into the sterilized jars. 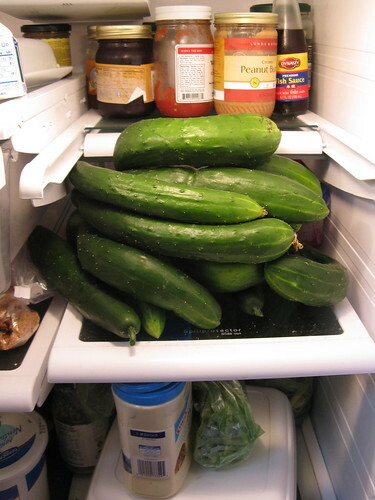 That's a lot of cucumbers! I love a good crisp pickle! Wow! You're getting a good harvest from your garden despite the cool temps this year. That's great. You reminded me to make some pickles. Love the crisp ones. So will family be getting pcikles for Christmas. Yum! Nothing better than a good crispy pickle that slaps you back in the kisser when you bite into it. How about bread and butter pickles? Have no idea what makes them bread and butter, but they always taste better to me. I love pickles. I'm one of those people that can just snack on them and a good sandwich requires their presence. :) My mom always makes great pickles, but I've never tried. Yours sound and look so great! That was quite a garden in your fridge! Very cool! I have been doing the same -- I've been tweaking ratios to try to narrow in on my ideal kosher dill-style pickle. Not quite there yet but I'm enjoying the results of the experimentation! That's an amazing crop of cukes! I love pickles, can't wait to see which of the flavours you think works out best.